This is the set that started it all for the Topps Heritage series. 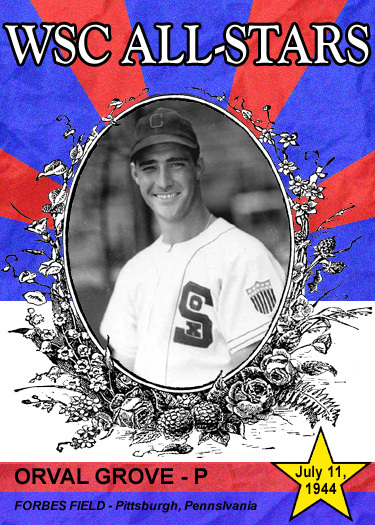 This started as a way to celebrate Topps' 50th anniversary of modern baseball card sets. Topps doesn't really acknowledge the 1951 red back and blue back sets, nor their 1948 Magic Photos set, which featured nineteen baseball related photos. Let's just say everything baseball related for Topps began in 1952. What's a little revisionist history between collectors? Beckett magazine called 2001 Topps Heritage the "Product of the Decade". That's high praise. It's no wonder that the Heritage line is on its nineteenth straight year, as of this writing. 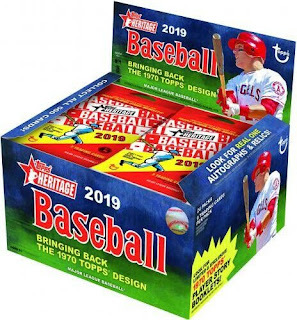 Topps pulled out all the stops with its first Heritage set. The majority of the photos were blurred to replicate how the photos looked in 1952. Some of the same variations were thrown into the set, so it looked and felt like the original set. One dead giveaway, besides modern players, would be the normal standard size for the cards. The standard sizing wasn't established until the 1957 set. 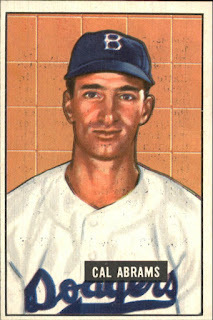 1952 through 1956 Topps baseball cards are larger than the standard size. On a related note, the 1951 baseball release was much smaller than the standard size. 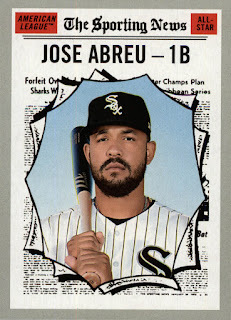 The White Sox have nineteen cards in the set, including two variations. There is something weird with this set. While there are short prints, there are none for the White Sox. This means that it shouldn't be extremely difficult to obtain a team set, even with two variations to chase. Topps really did something right with this release. They may have gone a little nuts with successive Heritage releases, but they started off golden. Topps Heritage is here for another year. 2019 copies the 1970 design. While the 1970 design is not the best design Topps has ever done, it is still beloved and has great elements to it. I'm a big fan off the font for player names on the regular single player cards. I didn't truly appreciate it until I replicated it for other projects. There are some collectors who find the 1970 set to be their favorite. I thought a little differently, but respected their opinion. 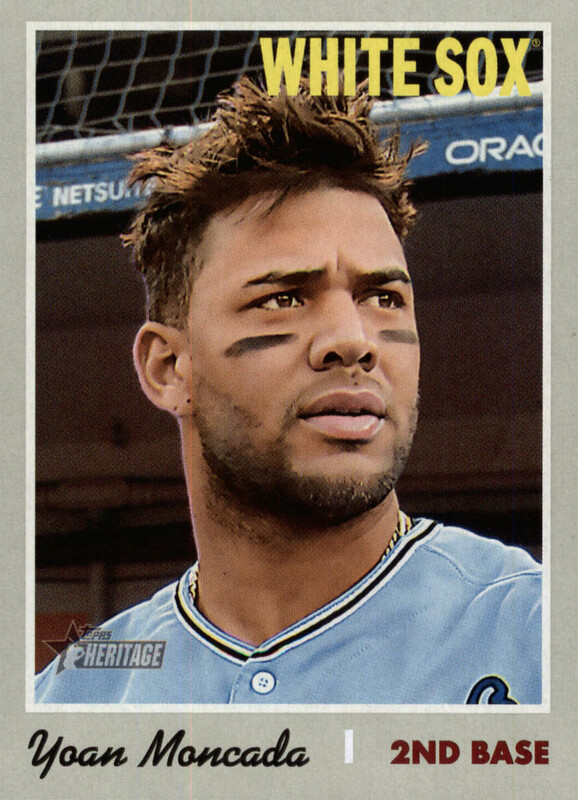 It wasn't until I saw the Heritage set, that I really saw photos pop. I'm used to seeing the 1970 set through the eyes of the past. The colors have faded a bit and blend into each other in most examples that I have seen. The 1970 and 1971 sets are notoriously hard to find in mint condition, especially the 1971 set. That could have added to my perception. For every cool Lowell Palmer card, there were many other examples of Topps photography choices that were a bit lazy or off. While this overall set has the Lowell Palmer equivalent in Pat Neshek, I don't see those bizarre choices in photos. For the record, I couldn't think of a better subject to replicate the Lowell Palmer card than Pat Neshek. If he ever joins the White Sox, that will be a great day. What I do see is photos that pop. They pop better because of the grey background. There is only so much you can do with staged photographs, but this set doesn't feel like there are as many limitations. Of course there are the obligatory airbrushed (now Photoshopped) images. If you are paying homage to a set full of airbrushed masterpieces (and I say that lovingly dripped with sarcasm), you need to replicate it. 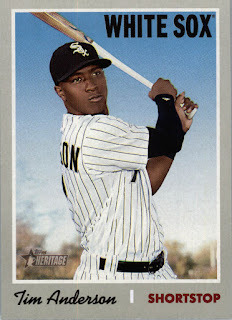 The White Sox have a total of twenty cards, including one "action" variation and one "throwback" variation in this set. 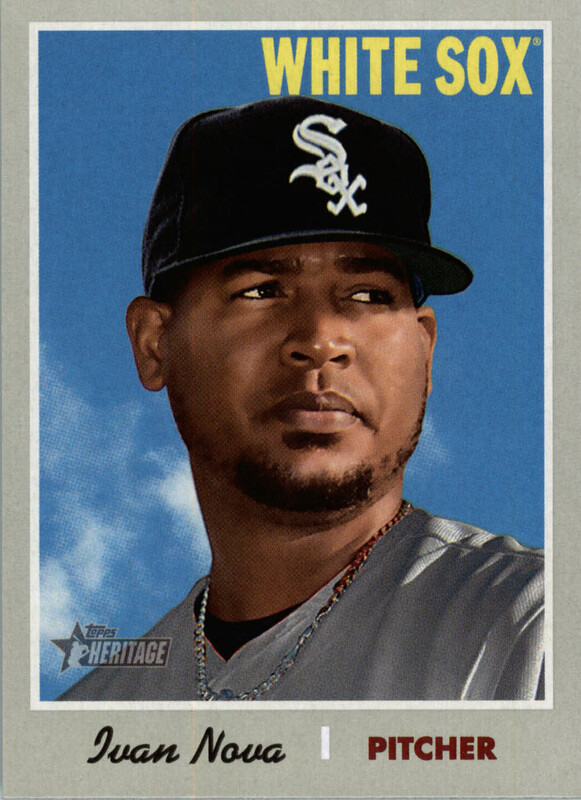 Another great job by Topps with their Heritage line. This team set is plentiful, yet not too crazy to collect. Only two short prints and a variation. That's not too bad in modern day card sets. 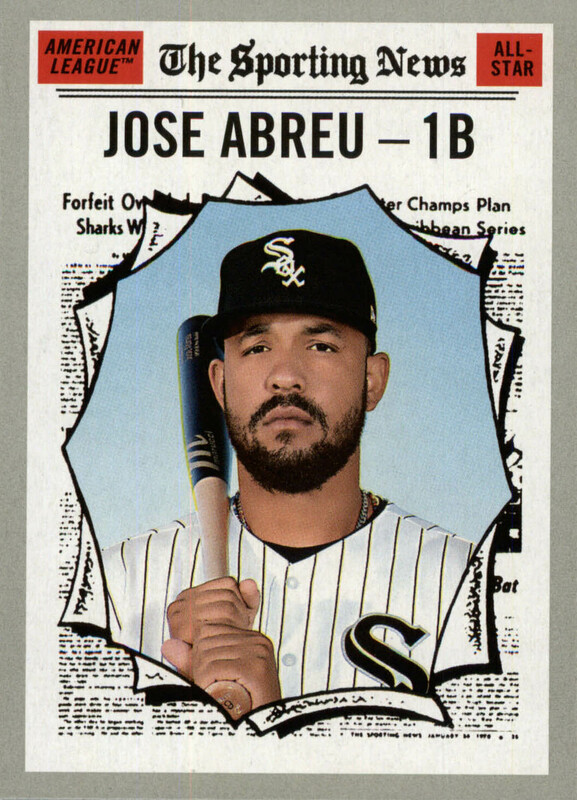 UPDATE: A super short print of Jose Abreu's card #483 has been found and this review has been updated to reflect this. 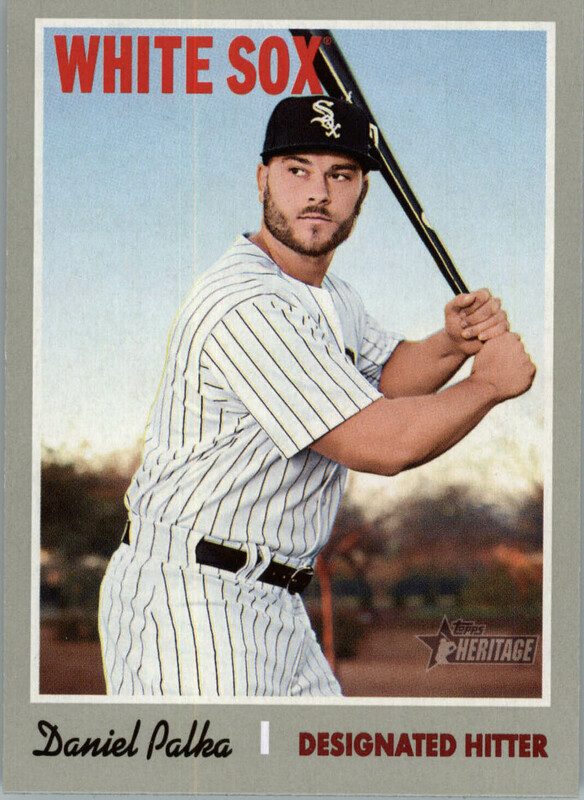 Topps Heritage borrows from the 1969 Topps set. I've gone over before about how simplistic the design is. I wouldn't change a thing about the design. 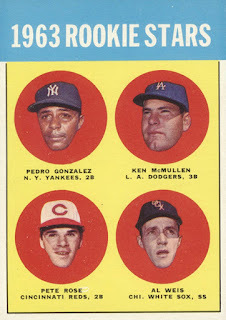 The Topps designers were hitting it out of the park throughout the sixties. While by no stretch of the imagination would I call this a grand slam of a design, I am willing to call it an inside the park home run. It's not as awe-inspiring as those dingers that go over the wall. There might not be fireworks shooting off. There is the excitement of getting a home run without all the fanfare. It kind of sneaks up on on you. There are no huge names in this team set, but sometimes that's even better. I appreciate it more, when card sets focus on the common players or minor stars. Don't get me wrong, I love the superstars, but how many different (enter superstar player) cards do I need? Of course, I'll need those too, but how many of (cup of coffee player) do I have? Exactly. When I collect, I try to collect everyone. It takes more than a handful of players to make a team. Why shouldn't my collecting reflect that too? 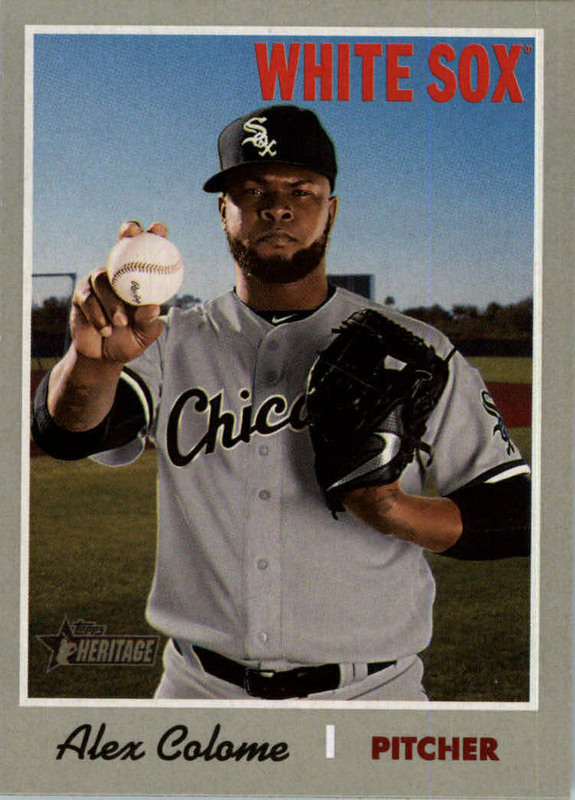 The White Sox have four cards in this set. There are no short prints or variations. This small team set is a nice addendum to the regular Heritage set. It features players that might not get a card otherwise. Heritage is always near the top of my collecting lists every year. It's easy to see why. 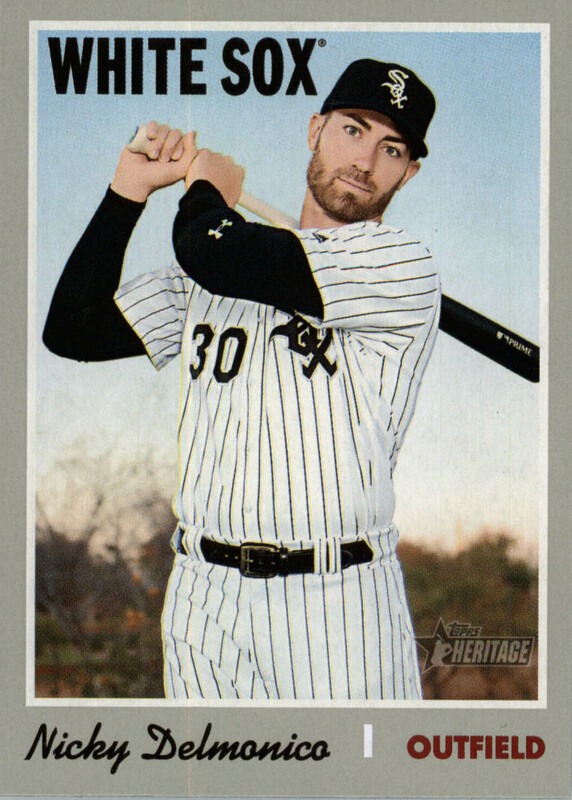 2018 Topps Heritage borrows the design from 1969 Topps. I'm a fan of all the sixties designs, but the '69 set is probably near the bottom, if I were forced to rank that decades sets. It's been used enough over the years from Baseball Card Magazine inserts to this Heritage release to become recognizable. It's simplistic, straight to the point. Topps, as always, does a nice job of copying their past sets. It feels enough like the original set that one feels bathed in nostalgia, even if you didn't grow up collecting those the year they came out. It wouldn't be a modern Topps release without a ridiculous amount of gimmicks and variations. This set is no different. From short prints to color variations, there is something for everyone to shake their fist at. As it becomes increasingly harder to collect everything from a release, it gets more frustrating as a collector. Those dopamine highs when you pull something deemed special still exist, but they are few and far between. 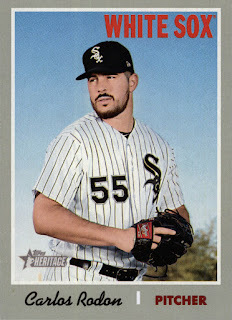 The White Sox have fifteen cards in the set, not including variations. It's still one of the nicer sets out there consistently, year after year. I enjoy collecting Heritage every year. I'm growing impatient with the gimmicks. They were cute ten years ago. Now, they are getting over the top. Chase the gimmicks, if you would like to slowly lose your sanity. Chase the base set if you want something to cherish. My friend came to visit for a few days back in October. (Yes, I picked these out in October. Yes, I'm just posting about it now.) One of the places that he wanted to visit was the card shop. I reluctantly agreed. He picked up some Ryne Sandberg cards and I picked up these cards. 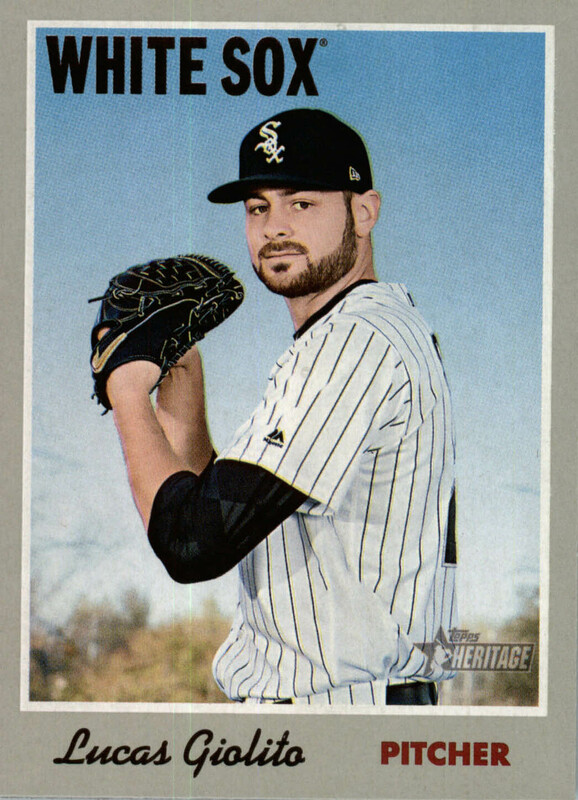 I will tell you that it is difficult to find a full spectrum of White Sox cards in Kalamazoo, so I was lucky to find these. 2008 Upper Deck Timeline #161 - Ken Griffey Jr. I already had the Griffey card, but it didn't look familiar to me and I didn't have access to my list. Maybe I will try to get it autographed at some point. Has anyone had any successes with Griffey Jr. TTM? I was pretty stoked to find the Pete Ward card. 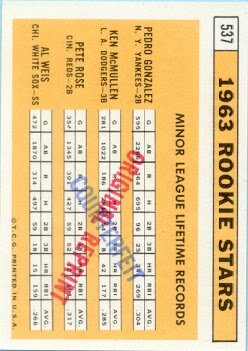 I've always been fascinated by the '65 embossed cards. 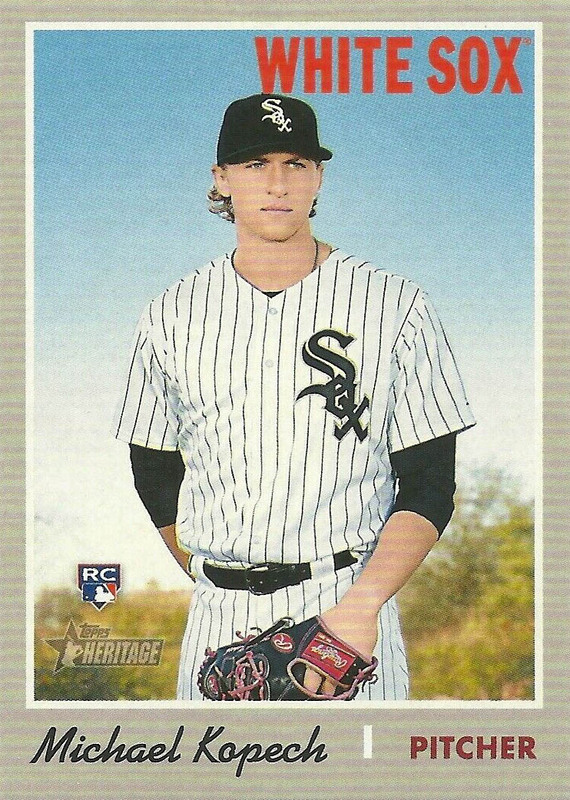 A Chris Sale rookie? Sure! Still doesn't remind me of Studio, but I like it. Can't Panini get their license already? I'd prefer logos. A nice inset set that escaped me for White Sox cards. Another card from one of the few sets I'm trying to complete. Hey! A Rookie of the Year card! Never saw this particular card when it first came out. I never seem to get the White Sox cards on National Baseball Card Day. Some years I miss it completely. Shhh. Not a bad haul from a card shop that specialized in Tigers cards. I'll be honest with you. The primary reason I like this card is because it looks like the original picture was taken in the bathroom. It could be the first MLB selfie. 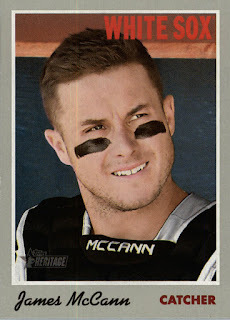 I'm not sure why an outfielder that played forty-six games in his first two seasons got a card. Bowman even brags that Cal hit .205 in 1950. It is a definite improvement from .083 in his first season. I'm always fascinated by vintage cards. Especially when they are much older than I am. It might be the discovery of players that I never knew about or teams in locations that I will never be able to see a game at, in cities long since abandoned by the teams. Supposedly for greener pastures, but that is debatable in some cases. It could be that all the fresh young faces look like they've seen some stuff. Horrible stuff that aged them. Cal was twenty-seven in 1951. He looks a lot older than that. Perhaps in was his military service that aged him. He was in the army in Battery B 500th Anti-Aircraft Artillery. He served in Europe and the Pacific, earning two battle stars in the Pacific and Cal was awarded the Philippine Liberation Medal with one bronze star. He was in the army from January 1943 until January 1946. So, Abrams certainly has seen some stuff. Vintage cards can let me glimpse into lives I will never knew. Into times I will never experience. All for the purpose of educating me to the world around me and the world that came before me. It's exciting and comforting exploring these strange worlds that have a familiar feel and context to them. The more I learn about the past, the more I can relate it to the present. Perhaps that is why I enjoy these cards and this hobby so much. I only have one 1920s card in my collection. This is not it. 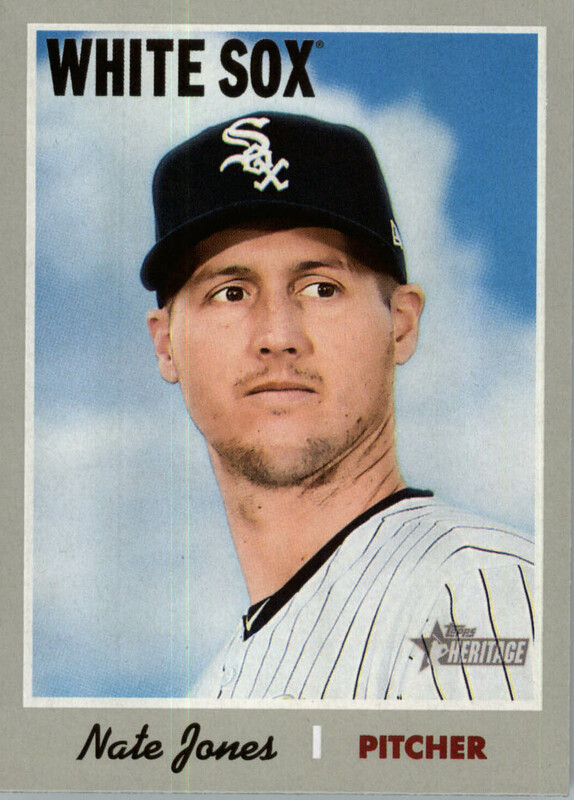 I would love to start collecting more 1920s White Sox cards, but my my family likes having a roof over our heads and food in our stomachs. It's most likely the reason that I don't have a card in my personal collection older that 1925. It's just not feasible right now. One day, if things go right, I'll be able to add to my vintage collection like that. Just not for the foreseeable future. That will not stop me from appreciating the hell out of those cards though! This card originally came from a strip of ten cards, which had to be cut by hand. That simply means that finding a gem mint card from this set is a near impossibility. While Eddie Collins is more recognized as a Philadelphia Athletic, he spent almost as much time as a White Sox player. I love diving into baseball history and I have a particular fondness for my favorite team. 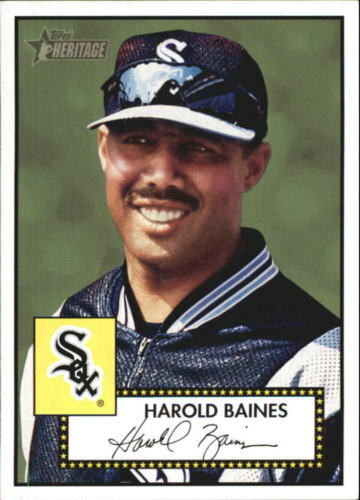 Eddie spent twelve seasons with the White Sox. That is a lot of time, stretching over a very interesting period. 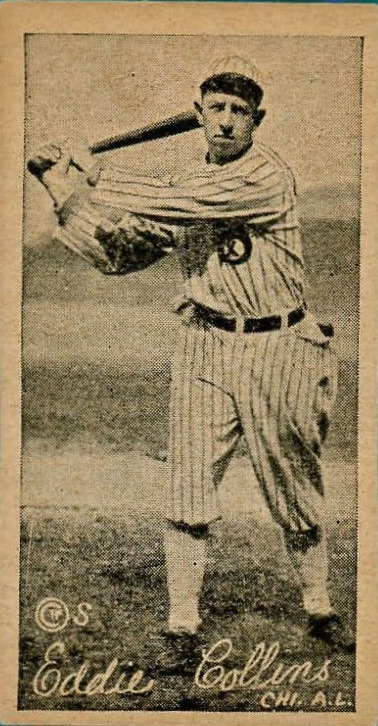 Eddie was with the Sox from 1915 until 1926. That covers two World Series, a scandal, and some dark times. The twenties were not kind to the White Sox. After the 1920 season, the Sox placed no higher than fifth until 1936. Of those years, they finished in last place three times. There really is a lot to discover from those teams. 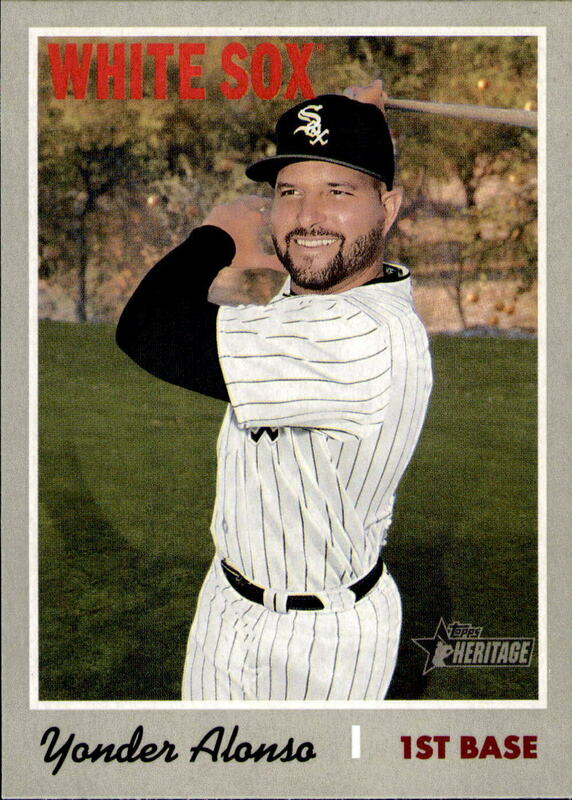 Part of the reason White Sox players are not better known from the twenties, thirties and forties, is that it is a time where baseball card releases were spotty. The White Sox would have some decent teams, here and there, but no consistency in winning. History remembers the winners much better than the losers and the White Sox were on the losing side of history for a lot of that. This allowed teams, such as the Yankees, to grab a foothold in baseball lore. The Yankees had a lot of great teams, but I always wondered how the White Sox would play out, if eight of their members weren't banned from baseball. I've already waxed poetic about the possibilities. It's fun to go back and play out what if scenarios in your head. What if such and such person was traded to your team. What would the repercussions be? What later moves would not get made? What if some player didn't retire or get banned? Would they continue to have great seasons? One could get lost for hours inside their own head, once you go down those roads. I discover new details about my favorite team all the time. Some things really have to be researched and dragged out into the light. Others were right in front of my face the entire time and I just couldn't connect it. Looking at cards like the W572 of Eddie Collins really gives my brain a workout. There are endless possibilities. Just like there seems to be endless baseball cards. I get that card companies have limited resources sometimes. They have to think on the fly and adjust to all the changes that happen in MLB. Players switch teams all the time. Sometimes, card companies crop photos, take hatless shots, even airbrush, all in the name of staying as current as they possibly can be. Then there's general laziness or rushed jobs. This Walt Williams seems like a rushed job. Something looks really off about the card at first glance. Looking closer, the airbrushed hat isn't the best, but I have seen much worse. You can tell that the Indians logo is airbrushed on. What turns a rush job into lazy is the lower right hand corner. The leaping outfielder silhouette doesn't quite cover the gigantic White Sox logo on the uniform shirt, even though the outstretched shadow is trying valiantly to cover the artist's tracks. Even Walt's expression seems to say, "Lazy fools. Did they really think that nobody would notice. 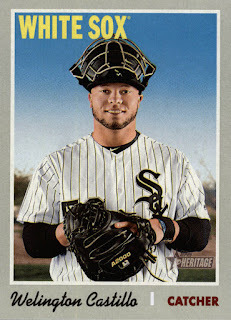 I'm clearly in a White Sox uniform." 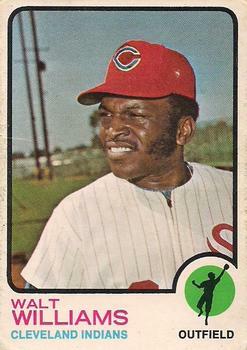 Walt was traded to the Cleveland Indians on October 19, 1972. It seems like plenty of time for proper changes, but things did progress a lot slower back then. I'll give them the benefit of the doubt and hope that the airbrush artist had a stack of photos to do and a tight deadline. Orval made it onto the AL All-Star team as a pitching reserve, but never made it into the game. 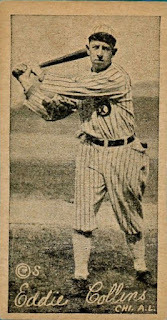 New York Yankees' Hank Bowory started the game, followed by Boston Red Sox pitcher Tex Hughson, followed by St. Louis Browns' Bob Muncrief, followed by Detroit Tigers' Hal Newhouser, with Philadelphia Athletics pitcher Bobo Newsom finishing the game. Tex Hughson took the loss as the National League won the game by a score of 7-1. I'm a sucker for history. I'm a sucker for a simple but elegant design. Put these together in a baseball card set and I'm intrigued. 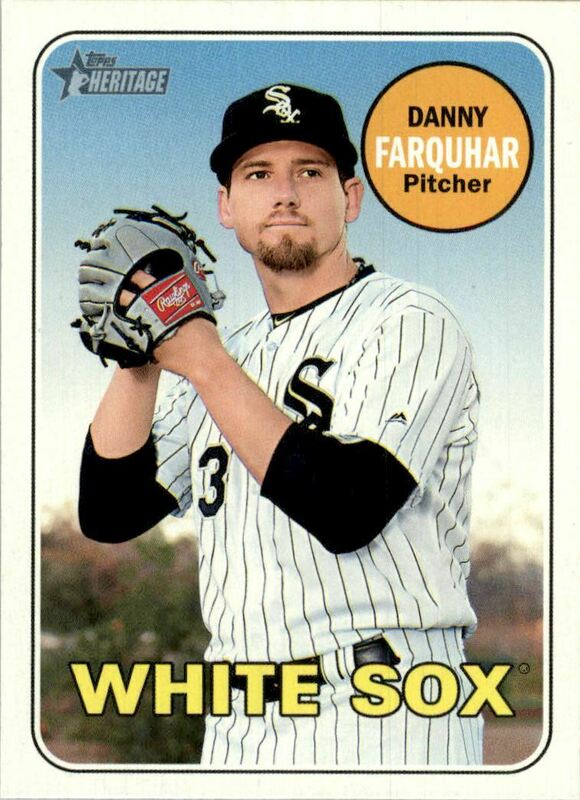 Throw some White Sox players into the mix and I'm in. While we are constantly bombarded by history lessons in our card sets today, it wasn't always the case. One of the best things I found out when I re-entered the hobby in 2007, was just how much history is present on cards. When I was growing up, there was TCMA and Hygrade. The templates weren't always thought out and tended to sport whatever trend was popular at the time.The two-tone Baseball Immortals set come to mind with it's neon colors. When real thought goes into the product, it shows. 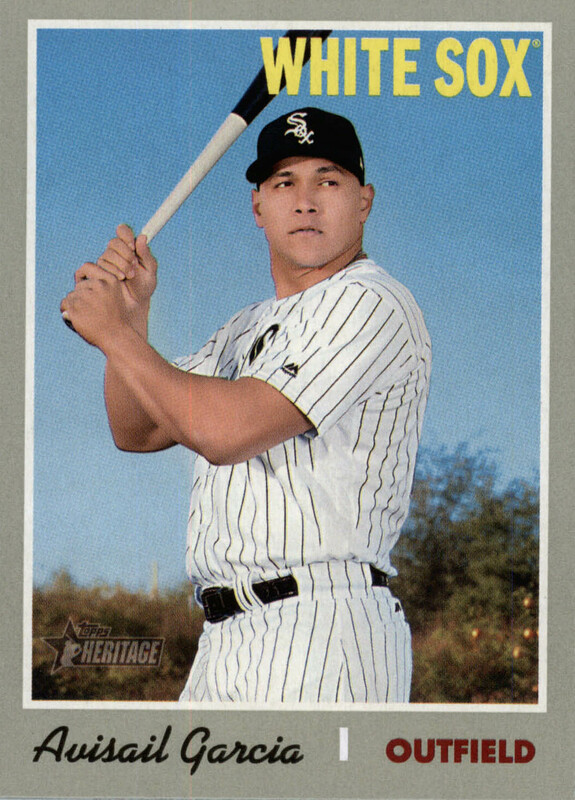 The Greats Of The Game set was one of the most popular in 2000. I can certainly see why. A thoughtful, simplistic design, that gently elevates the card subject. It fits. You can tell that it isn't vintage, but it fits right in with the themes of those eras gone by. The White Sox have two cards in this 107 card set. It certainly is a beautiful set. The players seem to pop out while fading into the background of time. The autograph insert set will be pricier to obtain, but not impossible. Aparicio and Wilhelm are the autographs in the insert set. Before we get into this, let me get one thing out of the way... Most of us will NEVER properly complete this team set. I know what you must be thinking to yourself. "There is no way that I can possibly know that. I have mad collecting skills. I am resourceful and always find a way, even though I'm on a budget. I get things done. I overcome my challenges." Let me reiterate. Most of you (not all) will NEVER properly complete this team set. 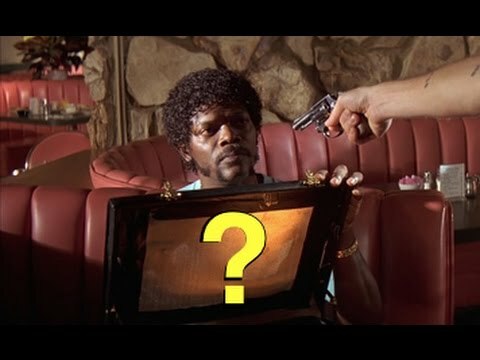 "Nellie Fox can't be worth that much! It's far from Luis Aparicio's rookie season. What gives?" I hate to break it to you, but Luis Aparicio is not in this team set. 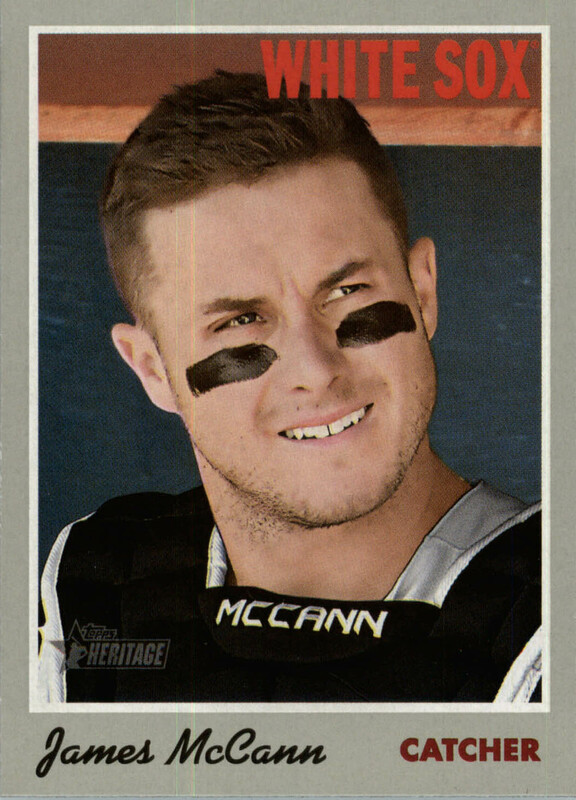 Topps already has him on the Orioles. 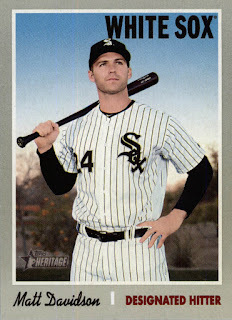 You most likely will never properly complete a White Sox team set and it's not because of any White Sox player. In fact, the only White Sox connection to this player would be through his son, who played in the White Sox minor league system from 1994 through 1996. If you are up to the challenge, there are a few ways around this problem. One path leads you to acknowledge that you will never have a complete team set. Another way is to travel down a dark and seedy, illicit path. Another way would be to miss a couple of mortgage payments in order to obtain this card. It is the infamous Pete Rose. 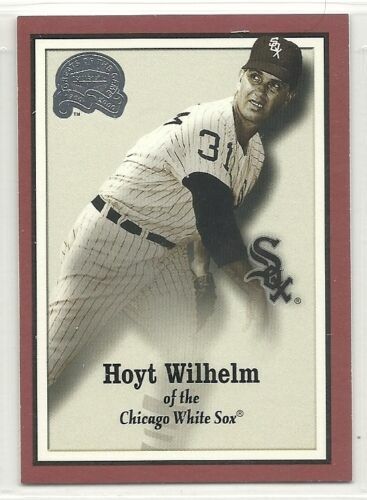 It's just unfortunate that Al Weis is also on this card. If you haven't sacrificed your living situation and you haven't resigned to the fact that your set will be always incomplete, what is the third option? More specifically, you will be looking for a particular counterfeit version of the card that was involved in a famous court case. These original fakes are stamped on the back. That's the route that I went. My white whale card is out of the way, albeit rather cavalierly. Newer reprints are flooding eBay, some for as low as a dollar. So, it's not impossible, just slightly unethical. So, now that that is out of the way. Let's enjoy this set! 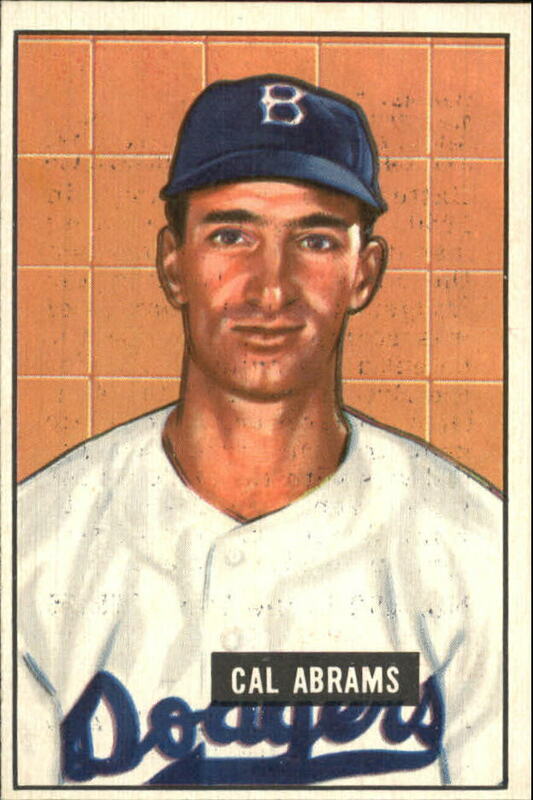 After the original Topps wood grain, the 1963 set exploded with color. Most cards have a nice head shot with a smaller "action" photo in a circle with a colorful background. There is simplicity in the design, but the color is what really pops. It especially pops when comparing the cards to the 1962 and 1964 sets. Classics in their own rights, but not like this. 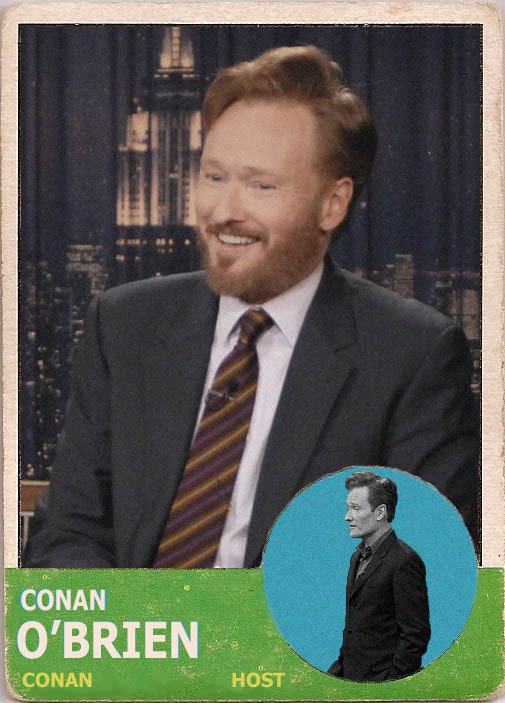 I liked the design so much, I even made a Birth Year card for Conan O'Brien during that short-lived Tonight Show debacle. 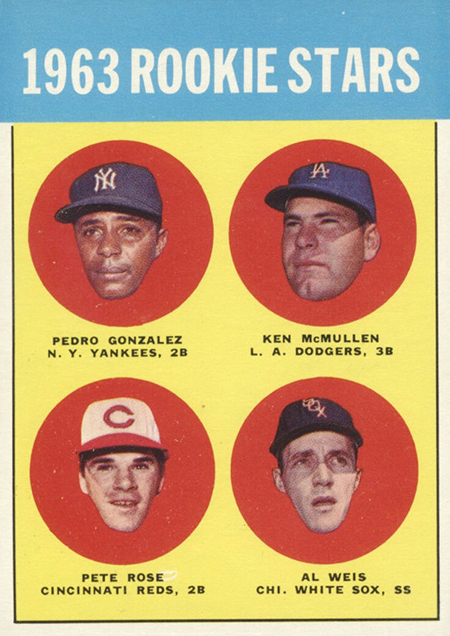 The 1963 Topps set is one of my favorites from the 60s. There are very few that can compare to it in the time frame. When Upper Deck did their Vintage line and basically stole designs from Topps, it didn't feel right. There is just something about the originals that feels right. I can't put my finger on what exactly though. All the elements work well together. 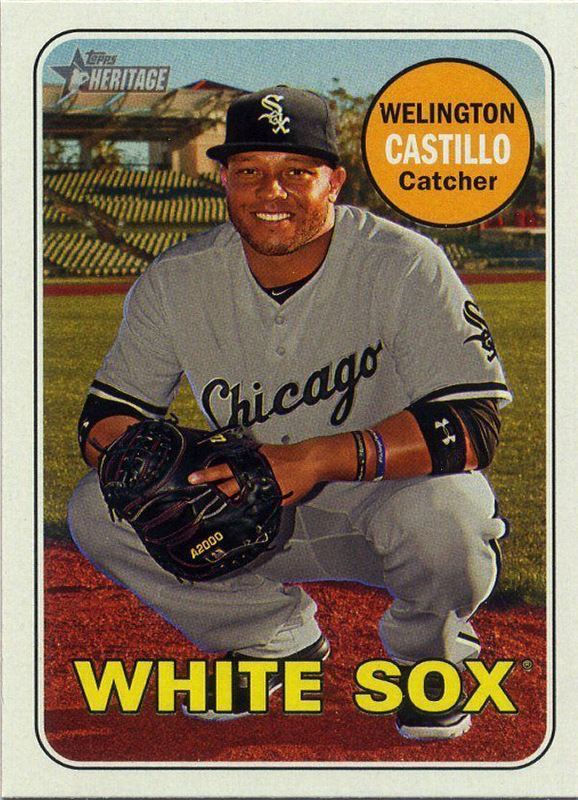 The White Sox have thirty-three cards in this set. 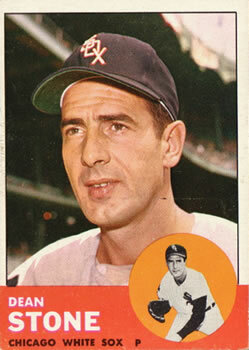 With thirty-three cards in the master team set, this would be a monumental task, even without the Al Weis rookie card. 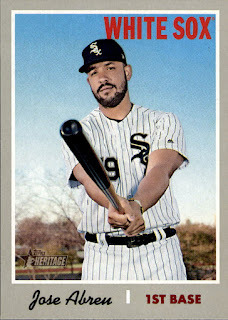 It shows how good and underrated these sixties White Sox teams were. If divisional play was in baseball before 1969, these sixties White Sox cards would be even more difficult to obtain at a fair price. It's a double edged sword. 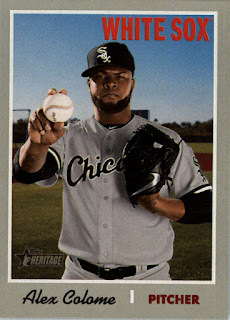 I hoped the White Sox would do well, but if they did well, the card prices would skyrocket. 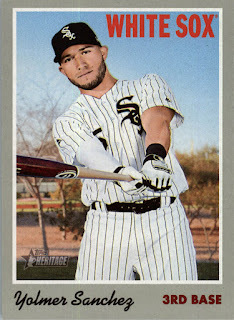 You may not be able to complete a White Sox team set legitimately, but these are great cards for your collection. They feature a great variety of players, rookies and leaders. Plus the colors really pop. I was not able to get to 2019 product until this weekend. 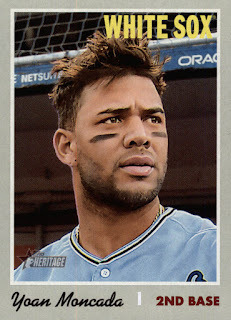 When 2019 Topps Series One came out, Michigan was in the middle of a polar vortex. We had temperatures near -50 degree Fahrenheit. I was not about to go out and shovel just to get cards. I know. Where are my priorities? Various weather related issues and watching my 15 month old grandson, kinda made me home bound for awhile. I finally broke out yesterday and got my hands on a blaster box. 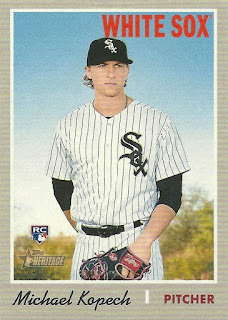 While some of you figured out yesterday that one of my packs contained a Michael Kopech card, this was the first card in the very first pack I opened of 2019 product. Not bad for a blaster. Over half of the base set without SPs and SSPs. Back by unpopular demand, it's America's unreasonable game, Sox Or No Sox. Our player in tonight's game is a 2019 Topps Series One pack. The pack contains 14 cards and features TWO Yankees on the wrapper. I don't know how to interpret that. It might be good or it might be bad. Let's begin. Right off the bat. First out of the pack. A WHITE SOX CARD!!!!!!!!! He's a cancer survivor. How cool! TWO TRAP CARDS IN A ROW!!!!! BEGONE WITH YOU EVIL TRAP CARDS!!!! Is it really, just us? Harper had 100 RBI. Scherzer had 300 strikeouts. Nice round numbers. I loved watching Don Mattingly growing up. Nice subset. Halfway through and there's tons of excitement. 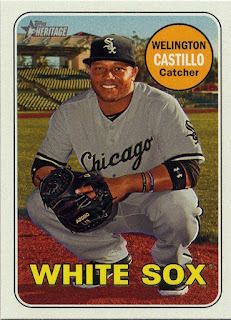 There's been a White Sox card and two trap cards so far! We still have a whole other half of a pack to go! Can you stand the suspense?! Can you take any more?! Hold on to your seats. This could get ugly! Let's return to the action! What exactly is the NOW factor in a card like this? Former Cub. CLOSE BUT NO CIGAR!!!!!! YOU'RE NOT TRAPPING ME THAT EASILY!!!!! A Cespedes for the rest of us! Sorry. Not sorry. Josh's rate of doubles and walks improved, while his long balls went down. Joe was drafted by the Blue Jays. He's hip. He's hip. Sorry. Not sorry. 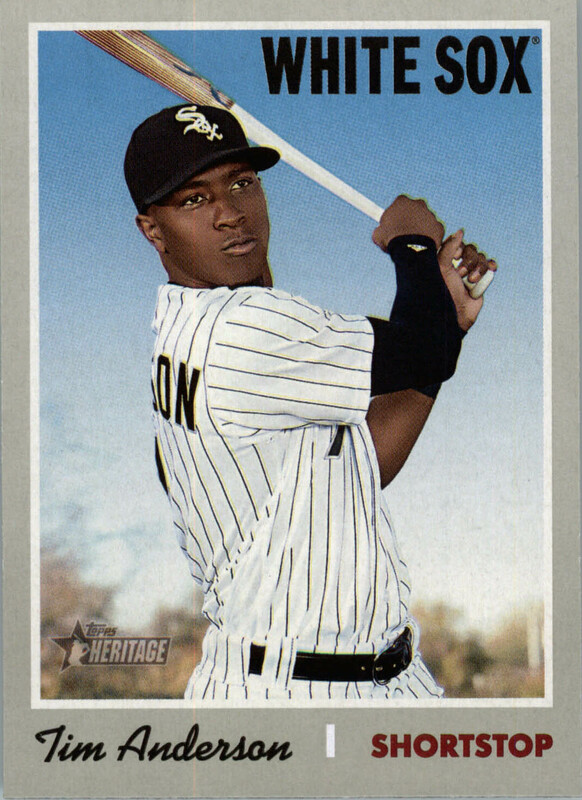 Robinson has been in the big leagues for 14 seasons! Wow! 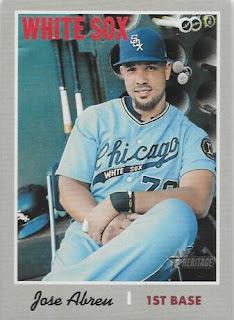 One White Sox card = 2 points. Two trap cards = -2 points. 11 non-trap cards = 5 1/2 points. 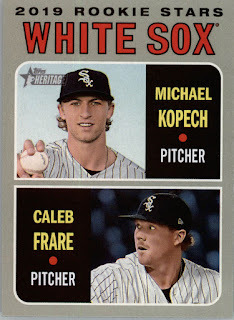 One White Sox card of a very promising rookie in this game, but there's always the excitement of the chase for more next time on Sox Or No Sox. And remember, never lean your head into a Randy Johnson fastball. It's for the birds. Goodnight everyone!